CALGARY - After being delayed by bad weather, three favourites at the Calgary Zoo have packed their trunks and left the city. 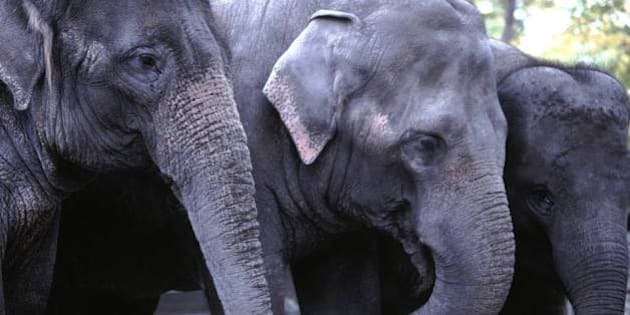 The zoo says its three female elephants, Swarna, Kamala and Maharani, were successfully loaded onto trucks Tuesday to begin their voyage to the Smithsonian National Zoo in Washington, D.C. They are being accompanied by a team of veterinarians, zoo-keepers and staff from both facilities. The journey is expected to last several days. The Calgary facility first announced in April 2012 that it would relocate its four elephants to zoos with more space and a more suitable climate. Animal rights activists, including retired game-show host Bob Barker, have long pressed for Edmonton's Valley Zoo to relocate its lone elephant, Lucy, so she can be in a warmer client and at a facility with other elephants. Calgary's pachyderms will be part of the Smithsonian zoo's newly developed Elephant Trails exhibit. They will be introduced to four other Asian elephants currently living there and eventually form a multi-generational herd. The Smithsonian National Zoo has more than 50 years of experience with Asian elephants both in the wild and in captivity, said Don Moore, the animal park's associate director of care. Two years ago, Toronto city council voted to send three elephants from that city's zoo to a sanctuary near Sacramento, Calif., after concerns were raised about their welfare.